We have crossed the fiscal Rubicon, and not merely because Congress passed a $400 billion budget-buster in the wee hours of the morning rather than abide a government shutdown beyond sunrise. And, not merely because the deficit is now locked in at $1.2 trillion or 6% of GDP during what would be the tail-end 10th year of the business expansion (FY 2019); or that it is on a path to doubling the national debt to $40 trillion during what will be the 2020s decade of demographic no return (i.e. 30 million more retirees on Social Security/Medicare). What really happened is that the politics of the budget have now become even worse than the numbers. In a word, the GOP congressional leadership surrendered control of the nation’s finances to Chuckles Schumer, Nancy Pelosi, Donald Trump, the military-industrial complex and the domestic spending lobbies of every shape and form. The conservative fiscal opposition—-what was left of it—–has been obliterated. Indeed, if the budget is a battlefield, and we can testify that it’s exactly that, last night amounted to The Battle of the Little Bighorn for the Freedom Caucus. Eight years on from the Tea Party uprising of 2010, they, like General Custer and his 200 men, are gathering flies where they fell on the steps of the Capitol at 5 AM. In that context, the House vote split tells you everything you need to know. The faithless Speaker of the House rounded up every RINO (Republican in Name Only), careerist time-server, fiscal hypocrite, blood-thirsty defense hawk and double-talking pork barrel pol that he could muster from the GOP caucus until he had 167 “yes” votes on the board. He then opened his hand to the Dems, who quickly delivered the 51 votes need to approve the bill and eventually threw in 22 more for good measure. Then and there, of course, the Swamp creatures took control of the US Treasury—even as Speaker Ryan sent the 67 Republican “no” votes out back of the Capitol to be shot. Here’s the thing. Mitch McConnell is a 54-year swamp creature and Paul Ryan is a gutless wonder. So, when Mitchels and Chuckles, as we labeled them yesterday, proffered their “bipartisan” deal in the Senate, Ryan had the choice of (1) saying hell no and standing firm for plan based on some semblance of GOP fiscal principles and GOP votes; or (2) sentencing the Freedom Caucus to an ignominious end. The finality of it, in fact, lies in the insidious essence of the deal, which is now the law of the land. To wit, the bill puts Washington on fiscal holiday until at least March 1, 2019, and in the interim the red ink emanating from the US Treasury will rise like the floodwaters of Houston last summer. There will be no stopping it. That’s because in the short-run the debt ceiling is suspended for 13 months. The Trump Treasury will therefore have open-ended, limitless borrowing authority and no reason whatsoever to heed demands for action—any action—–to curtail the Federal deficit by the walking wounded of the Freedom Caucus. The only tool they ever had—leveraging debt ceiling increases—–is now dead and gone. Likewise, the sequester caps are lifted for the next two years, meaning the way has been cleared for pork laden appropriations bills for FY 2018 and FY 2019. Accordingly, there will be no more shutdown showdowns and no more CR leverage for fiscal conservatives, either. Instead, discretionary spending, which has been creeping slowly higher every year due to last minute end-runs around the caps will now literally erupt. Over the next two years, defense spending will leap by $82 billion annually, and the price the hawks paid for that was a $66 billion surge in domestic appropriations, thereby re-establishing the “parity” principle by which the Warfare State and Welfare State crush the nation’s fiscal accounts. And in this instance, you have to ask exactly what was the defense emergency that gave rise to this hideous bargain. After all, the old capped levels, which reached back to the Boehner-Obama deal of 2011, will never again be revisited. Rather than spending $13.5 trillion on discretionary programs over the next decade, it will now be $16 trillion or more. But consider this. The entire GDP of North Korea is just $30 billion—-so the DOD increase along is 2.7X the entire economy of the only hostile foreign power that has threatened (verbally) the US in recent years. In fact, when you add-up the defense budget of all the alleged hostiles—- China ($215 billion), Russia ($69 billion), Iran ($12 billion) and the entire GDP of North Korea—-you get $325 billion. 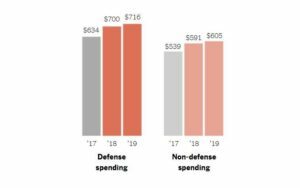 That’s less than 45% of the $716 billion bonanza bestowed on the defense department last night. Next add in the defense budgets of Saudi Arabia ($64B), India ($56B), France $56B), the United Kingdom ($48B), Japan ($44B), Germany ($41 B), South Korea ($37 B) and Italy ($28 B), and guess what? You still have less ($700 billion) than the DOD’s cornucopia of budget resources. Yet as that heroic American, Senator Rand Paul said during his filibuster last night, nobody would be talking about defense budget this crazy big if we were not conducted 7 different wars—-all of them completely pointless and irrelevant to the safety and security of the American people. Stated differently, the military-industrial-congressional complex is now ruling the roost, which means that it will be impossible to cut a single dime of domestic spending as far as the eye can see. Given the rather certain explosion of debt service costs to more than $1 trillion by the middle of the coming decade and the baby boom driven entitlement wave, Federal outlays are heading toward 26.5% of GDP or higher compared to 21% in the year just completed (FY 2017). At the same time, the drastically front-loaded tax cut will reduce revenue to just 16.5% of GDP in the year ahead. The math of it is that the US is now heading for a 10% of GDP deficit on a long-run basis. Worse still, there is now no process available to slow the drift toward calamity. As a result of last night’s action on a two-year budget deal, the Congressional Republicans can now dispense with a budget resolution for FY 2019 entirely–even though it is notionally required as a legal matter. That will spare them of the inconvenience of voting for a ten-year fiscal plan—along with the political shame of it. In effect, they have now institutionalized trillion-dollar annual deficits as far as the eye can see; added $15 trillion to the public debt in the next decade; and left the US with $35 trillion of public debt and a $2 trillion annual budget deficit by 2027, which happens to be the peak year of Baby Boom retirements. And that, of course, assumes no recession in the interim. Since we don’t believe for a moment that the current faltering business expansion will last for a record 219 months, or double the previous longest expansion in recorded history, the true fiscal facts will ultimately be a lot worse. At the same time, no FY 2019 budget resolution also means no chance whatsoever for entitlement reform—not even a minor beating up on food stamp recipients in behalf of stronger work requirements, which would only save a couple of billion per year, anyway. That’s because without “reconciliation”, getting any reform package through the 60-vote Senate filibuster has less chance than a snowball in the hot place. So, now the bond market will be tested like never before. During FY 2019 starting in October, the US Treasury will borrow $1.2 trillion and there will be no possible legislative action to stop it. And that will occur even as the Fed dumps $600 billion of existing debt back into the market. Unless the law of supply and demand has been stealthily repealed by the economic gods, a conflagration of biblical proportions in the bond pits is now unavoidable. And when the 19-year yield hits 3.50% and then 4.50%, it will be Katie-bar-the-door in the entire casino because nothing like the drastic collision ahead is priced-in to equities or anything else. Accordingly, if you want to grasp how the Fed’s Bubble Finance and the destruction of honest price discovery have left the casino defenseless in the face of the reckoning just ahead, you can’t really find a better illustration than the recent ionization of the XIV. Indeed, it took a bit over six years for XIV (an inverse VIX product, its VIX spelled backwards!) to rise from $10 to $144 but only one day for the product’s price to implode to $0. That’s what happens when bubbles burst, and we are now sitting on the mother of all financial bubbles. As we argued on Fox Business today, what happened on the floor of the House yesterday may finally be the Red Swan. At the least, it will prove to be a major fulcrum point in ending the financial fantasies of the last three decades. We called it The Night of Fiscal Infamy, and it surely was. David Stockman was three times elected to the US House of Representatives from Michigan but did not serve his third term as he was selected by President Ronald Reagan to be his first Budget Director (1981-1984). After leaving DC, he spent 20 years with some of the most prestigious investment firms on Wall Street. He also authored several best-selling books on the political and economic problems that the United States faces. Because of Stockman’s background, he provides unique views on what’s happening in Washington via his David Stockman’s Contra Corner.